Donna Colton said it might be fun if my dear wife Karen came out to The Ridge to see and hear Crystal Visions. Good idea that was, my humble friend with the awesome singing voice. Colton teams with fellow Central New York vocalists Maureen Henesey and Joanna Jewett, they’re backed by Kris Heels, John Kelsey, Frank Neubert and Sam Paterelli. The chemistry is right with all of them. As you might have guessed from the band’s name, they specialize in the music of Fleetwood Mac. Popular, they are. We got to the golf course/tavern tucked away down Salt Springs Road with plenty of time to spare for the 5 p.m. Sunday start. And the only two chairs together left were way behind the stage and in the corner. We dug the talent from there. These women can all handle the lead. And their harmonies are truly special. On this gig, they specialized in the music from a legendary album that’s celebrating its 40-year-mark in its culture. Yes, I have spun Rumors on the turntables and CD players of my life a time or a thousand. I’ve also been fortunate enough to see Stevie Nicks, Lindsey Buckingham, Mick Fleetwood, Christine and John McVie and mates live in concert, driving west to Buffalo for a cool show in the huge arena a couple of decades ago. This intimate show hit my good buttons, too. 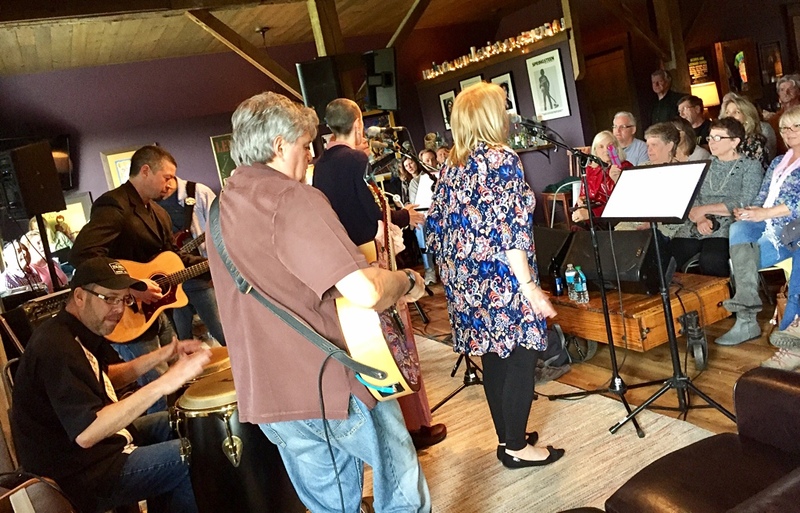 Crystal Visions carries the aura of veteran musicians who know their way around every song, confident, proud, able and ready to connect with the audience with every note and word. I used my iPhone 6 (trying to stay out-of-the-way of the folks behind us) to catch them performing the very cool Silver Spring. They’ll perform on the Taste of Syracuse main stage at 5:10 p.m. Saturday, June 3. Adding the music of Crosby, Stills, Nash and Young, they’ll go by the name of the CNY Songbirds that day. Make a left and keep going. Thumbs-up to The Ridge, too. It’s a slice of heaven. ← What are playsets, boats and big porches, Alex?